Liverpool’s defeat at Newcastle on Sunday means the only team in the Premier League with a worse record than Kenny Dalglish’s side since the start of the year are Wolves. Liverpool have won just two games from their last dozen in the league since 1 January: one of them was at Wolves, on 31 January, and the other was in the Merseyside derby against Everton on 13 March. They have drawn twice, at home to Stoke and Tottenham, and lost eight times in that period, against Manchester City, Bolton, Manchester United, Arsenal, Sunderland, QPR, Wigan and Newcastle. Liverpool have won just one of their last eight games. 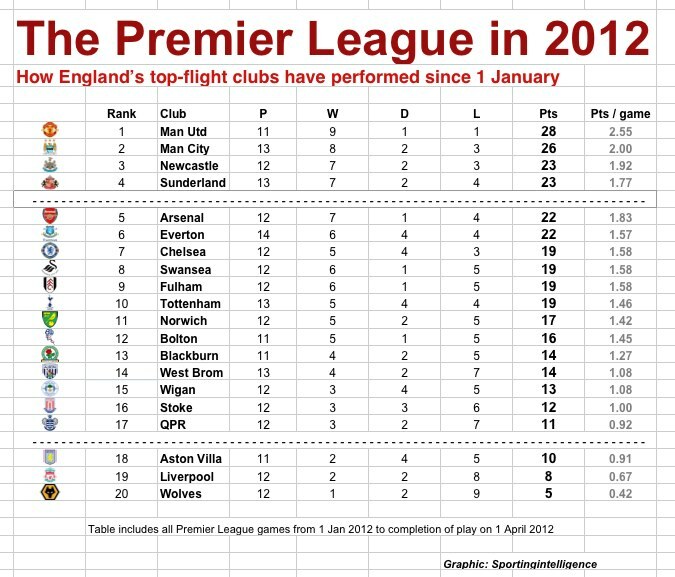 The 2012 calendar year table is below, with Manchester United topping it from Manchester City, as in the real table. Third and fourth place in this table go to Martin O’Neill’s resurgent Sunderland and Alan Pardew’s Newcastle. Joining Liverpool and Wolves in the relegation zone of the calendar year table are Aston Villa, in danger of finding themselves in the real relegation zone if their current slump continues. Obviously only one table really matters – the real one in which Liverpool are eighth with 42 points – but this 2012 does put in stark context the alarming dip in Liverpool’s form. It also shows the equal form of clubs as diverse as Chelsea, Swansea and Fulham, each with 19 points from 12 games in 2012, which is the same tally Tottenham have from 13 games this year.